One hundred and fifty years after its publication, Charles Darwin's theory of evolution, as articulated in his opus The Origin of Species, underpins mainstream science and animates debate among scientific and religious communities. The BBC backed biopic Creation, based on the biography Annie's Box written by Darwin's great-great-grandson Randal Keynes, highlights a similarly heated dialogue occurring for Darwin on a deeply personal level. Darwin (Bettany) is a man of decimated faith. The cause of the decimation was the death of his eldest daughter, Annie (West), whose ghost visits him throughout the film. The delusional Darwin seeks advice and comfort from this apparition of a child who, in life, had a curiosity about and fascination with life and the world that reflected his own. Darwin is a man who is well aware that his obsessive pet theory has the potential to destabilise the devoutly religious 19th century English society in the midst of which his work takes place. This potential is highlighted none too subtly by biologist Thomas Huxley (Jones) — nicknamed 'Darwin's Bulldog' for his advocacy for Darwin's evolutionary theory — who early in the film congratulates a horrified Darwin for having successfully killed God. This notion seems to terrify and haunt Darwin. Despite his scientific convictions and his professed lack of faith, the idea of 'killing God' causes him great anguish. In one scene, after a night spent scribbling his manuscript, he is shown frantically scrubbing at the ink stains on his fingers — Lady Macbeth trying to remove mythical blood. His anxieties are exacerbated by the concerns of two devoutly religious people in his life, his wife, Emma (Connelly), and his once close friend, Rev. Innes (Northam). Darwin's marriage is strained by his and Emma's failure to confront their grief over Annie's death; Darwin's planned sleight against religion intensifies the tension. His relationship with Innes, meanwhile, suffered its greatest blow when (we learn in flashback) Innes punished Annie at school for repeating her father's theories. The film is kind to all parties, except perhaps to the callous scientist Huxley, whom Jones portrays as an arrogant, spitting villain. It is certainly unrelentingly sympathetic to Darwin; almost overbearing in its efforts to portray him (his semi-regular dips into madness and his obsession with quack medical cures) as a broken and troubled man. The film's apparent unwillingness to cause offence is to its detriment. 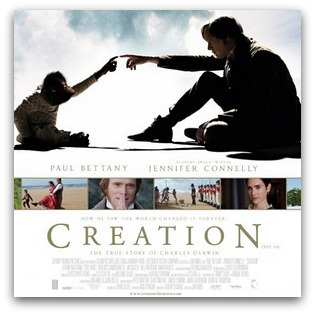 There is an insipidness to the film that is unlikely to please parties at either extreme on the science-religion spectrum, although those who have settled in a middle ground such as intelligent design may be drawn to its clever tagline 'faith evolves'. That said, the emphasis on Darwin's relationship with Annie is effective, particularly in scenes where he regales her (or her ghost) with tales of his exploits in the Galapagos Islands. The film aims for the personal rather than polemical, and exhibits much charm in that respect. Tim Kroenert is Assistant Editor of Eureka Street. He is a regular contributor to Inside Film and The Big Issue magazines, and his articles and reviews have appeared in Melbourne's The Age and Brisbane's Courier-Mail. He was Chair of the Interfaith Jury at the 2009 St George Brisbane International Film Festival. This film is very timely for those of us who struggle with our religion. The fact that you say this film aims for the personal rather than the polemical makes the anticipation more worth while. As a supporter of the Intelligent Mind (not design) theory may I suggest that the amazingly ‘gifted’ Charles Darwin struggled within himself due to his competing ideas: his intuitive notion of evolution was in conflict with his religious beliefs (which were endorsed by Emma and Rev. Innes). Prof. PZ Myers said recently that the human mind is a product of evolution (Global Atheists Conference 2010). As a Christian meditation practitioner I think it makes sense to believe that Evolution has God at its centre to the extent that: the cosmic complexity has God consciousness as the basis of all its life patterns: “In the beginning was the Word” (Prologue of John’s Gospel). The Cistercian physicist Beatrice Bruteau claims that to be alive is to evolve; to be constantly in the process of growth, expansion and renewal. She says it happens on a small scale with every biological form we know and it happens on a large scale in the universe as a whole. If humanity was consciously mindful then perhaps we could mirror the function of the Trinity (an image of mutual reciprocity). Charles Darwin used his God given mind to question and search for a greater understanding of his world, this energy of thinking and knowing must have caused much tension with his religious faith which had been shaped by Church authority that had captured God in an image and defined Him in language and dogmas. The problem with Church authority is that its energies are centered upon their self- created institutional Church rather than in formation of a creative mindful union with the people of God. They try to assimilate all others into the Church way of being. If you read Scripture then this is not how the mind of God functions. Jesus taught that we should use our energy for the other person; in loving and willing goodness for the other on the level of personal relationships. It’s no wonder Darwin struggled with a compulsive disorder - desperately trying to erase the falsity within his personal world. Like Galileo too, many have suffered at the hands of religious zealots. As Meredith approaches, two boys appear on the cliff and call for the boat to turn back. This allegory for the asylum seeker experience is not entirely out of place: Meredith seeks asylum from personal horrors that lie in her wake. But the curdled milk of human unkindness flows readily. Your profile .. Your pics, updated .. Your 746 Friends .. Fend off the texture of the universe. F***book will f*** You.